Sound Heaven Studios is the premier boutique recording studio in the Sydney region. Based in the Blue Mountains, we offer music recording, mixing and mastering services. Sound Heaven Studios offers the facilities of a large recording studio, but at a small studio price. Our engineers draw on many years of experience in all genres of music. We aren't just button-pushers, but involve ourselves in every project, ensuring that the final recording is the best quality possible. Artists come to our recording studio from all over NSW, seeking our unique blend of production assistance, recording expertise and great rates. Being close to Sydney, our recording studio not only attracts many Sydney-based artists, but is in the perfect location for artists who require session players or programmers for their recordings. Some of the artists that have used our studio include Hermitude, Thundamentals, Urthboy, Pugsley Buzzard, Kate Rowe and Rachel Brady. Read what our artists have to say our studio here. Location: Tucked away at the edge of Blue Mountains National Park, one hour from Parramatta, Sydney. To view a map,click recording studio location. 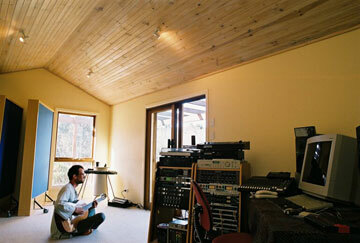 Rooms: The studio consists of a large, airy control-room and two connecting recording spaces. Creative environment: Overlooking expansive valley views, we offer the ideal creative environment. Mixing: MCI J600 36-channel mixing console. This desk is supplemented with a Speck X Sum line mixer, giving a total of 68 inputs. Click recording studio equipment to view a more complete list of gear. We master to a Korg MR2000 1-Bit Studio recorder. Software: MOTU’s Digital Performer, compatible with all well-known audio software, such as ProTools, Logic and CakeWalk. Outboard equipment: We use a range of top-notch reverbs, equalisers and compressors. Click recording studio equipment to view a more complete list of gear. Tape: We have tape recording available upon request. Microphones: Our range of microphones is second to none. We cover all of the three types: condenser, ribbon and dynamic. Click recording studio equipment to view a complete list of microphones. Competitive rates: We offer the best rates in town for the quality of facilities provided. To view our rates, click our recording studio rates and packages page. Recording Studio Facilities Looking for a special deal? For recording studio rates, as well as studio/accommodation packages in the Blue Mountains, click our recording studio rates and packages page. For information about mixing music you've already recorded at home, visit our home recording page. For information about mastering, available wherever you live in NSW or Australia, visit our audio mastering page.